Dave Wilson: And just what is it that you’re seeking? Carol Johnson: [Breathy] To warn you that you are in grave danger! Larry and Dave have made it to France. Larry goes off to play his part by interviewing Professor Teal. During the interview, he is handed the slip of paper, the map, as planned. Everything seems to be going fine, running smoothly like clockwork. Dave Wilson waits for him at a café called Les Deux Magots. This is a very famous café on the Left Bank of the Seine river. It opened in 1885 and is still in Paris to this day. The name of the cafe means “The Two Mandarins” — an old name for Chinese government officials. 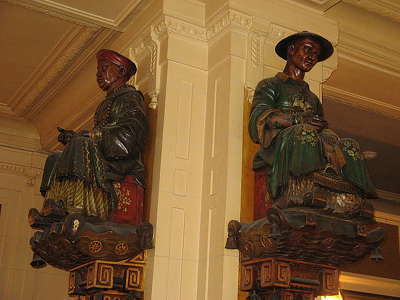 Inside the cafe there are two carved statues of Chinese Mandarins which likely date back to the 1880s when the building was a novelty shop, not a café. Thecafé kept the name of the former shop. It was quite a fitting name as Mandarins had to pass an exam to get their government position. They were intellectuals, and the café attracted intellectuals, writers and artists. The two Mandarins oversee the cafe. As Dave sits at a cafe table waiting, he is approached by a strikingly beautiful woman with a phoney accent. She has a warning for him. When Larry gets back to meet Dave at the café, everything falls apart and he finds himself involved in a crime scene protesting his innocence. Larry is in deep trouble. If this happened to you, what would you do to prove your innocence? Leave me a comment in the side-bar on the right!